This post is a continuation of a series of posts about Lync Deployment. The documentation portion of this project has gotten the back burner, and I need to say that a blogger I am not.. but picking up the documentation of this process is important. 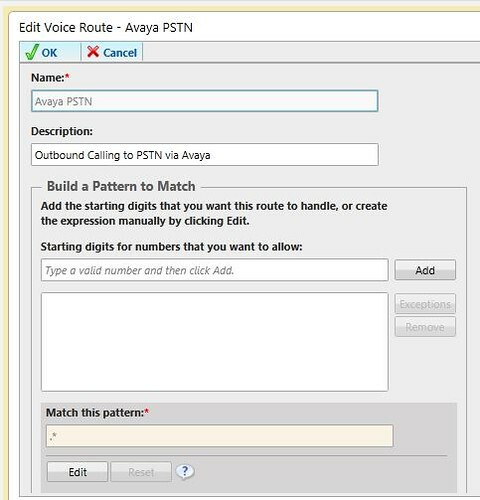 This can be used as a resource to configure an Avaya IPOffice (IPO) 412 (software version 5.0) as a Gateway for a Lync deployment calling the PSTN, with AsteriskNOW as a SIP proxy to resolve disconnected calls when placed on hold or transferred, your mileage may vary. Calls are routed over a SIP Trunk (Session Initiation Protocol) configured between the IPO and Asterisk and Asterisk and the Lync Front End server. 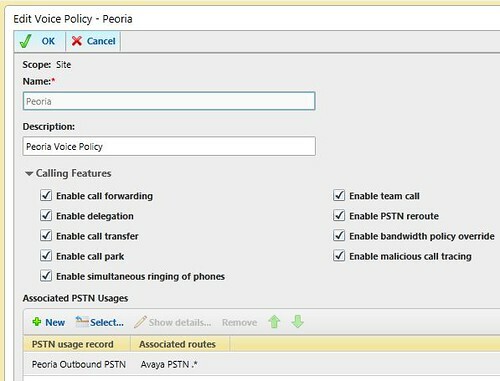 Once we deployed the calling from the PSTN via a PRI from the IPOffice to a SIP connection to the Lync Mediation server we were able to make and receive calls from Lync endpoints, however we quickly noticed that when calls were put on hold or needing to be transferred to another extension the call was simply dropped. It doesn’t matter if the call was being transferred to a Lync extension or an Avaya extension the call would drop. The only option to “hold” a call was to mute the call. If Hold was used the call would disconnect. After a few days of tracking this down we were able to identify this was an issue that happened every time. It wasn’t specific to a user or extension. In fact the Avaya white paper noted this as a known issue. The document notes that calls cannot be placed on mute, nor does the PSTN caller ID pass thru to Lync, these notes however that was not our experience. Mute and Caller ID worked fine on inbound calls. We tried several different solutions to resolve this issue. Our first attempt was routing all calls thru an inGate SIParator. This is basically a SIP proxy device. We happen to have one laying around from some testing with a SIP dial tone provider. This device had worked well with the IPO connecting to SIP Trunks that required authentication with a different authentication handshake than the standard Avaya methods. 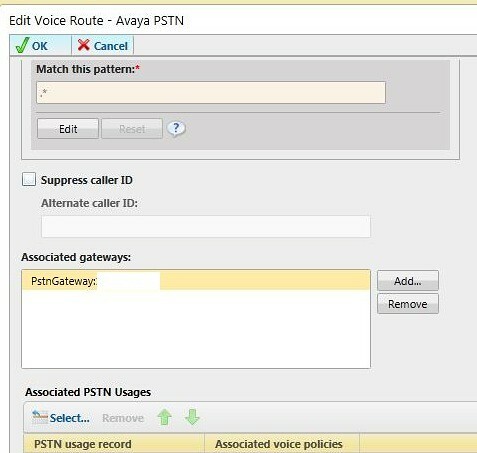 However the SIParator did allow to proxy the Avaya to Lync SIP trunk, but didn’t resolve the disconnects when holding or transferring calls. Next we tried to use a SnomOne software PBX, this had some promise, after configuring the call to forward all calls to the Avaya or Lync (which was a hassle) we found that this resulted in calls connecting but the caller not hearing any of the conversation, or the call would just stop passing audio although it remained connected. We also found that the SnomOne would keep terminated calls still active and you would have to reset the sessions manually. Finally we landed on an asterisk installation installed on a virtual machine. We installed Asterisk now (without the web interface) for simplicity. 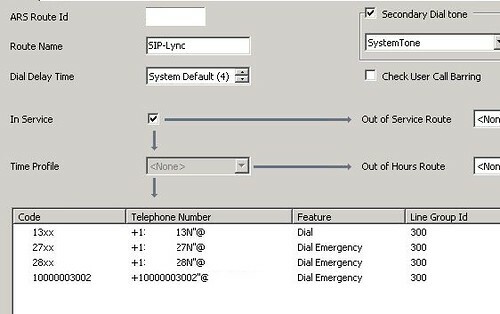 Once you configure the two sip trunks (one for Avaya and one for Lync) and build the dial plan to forward all calls from Lync to Avaya and all calls from Avaya to Lync the configuration was basically complete. Much Credit must go to my great Church IT RoundTable peer Dave Mast (@DaveMast) for his Asterisk Programming help! Kuddos to Dave! Below are the steps to configure the Avaya and Lync to communicate via an Asterisk Proxy. Install Asterisk on a machine, (in our case a new VM) and note the IP Address you give the server. Next configure a new Avaya SIP Trunk and ARS Table. The same steps as noted here, except you need to enter the information of your Asterisk server in step 2 as the ITSP IP Field. After completing steps 1,2,3 and 4. Complete Step 5 to prepare an incoming call route from Asterisk to the IPO. Step 6 is basically the same and we repurposed the old ARS table that we created but changed the short codes and features a little. Note in step 9 if you have extensions on both IPO and Lync you can’t use variables in your short codes. This remains true. After step 10 things change a little so I will document that here. The information may look very similar to the previous instructions with SIP for IPO and Lync with out a proxy but they are a little different. 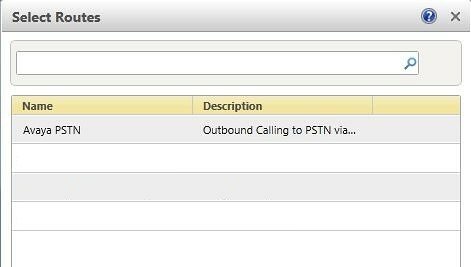 Because of how you have to pass calls from Avaya to Asterisk you will need to configure you rARS table a little differently. Step 10 walks you thru a extension with a DID, that in fact is no different. But Step 11 has changed. I have quoted the information that hasn’t changed and added what needs to be adjusted for the dialing plan to work with Asterisk. 11. 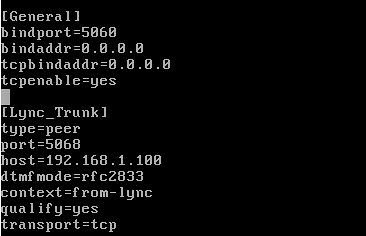 Configure routing for For Lync Extensions without DIDs (as documented here). An ARS entry will have to be created for each Extension since the IPO cannot use variables in the E.164 formatting of the outbound call and Lync requires the call to come in in the +11235556500;ext=4175 format. The Asterisk can’t pass the formatting with “;” so we will pass just the 4 digit extension from IPO to Asterisk, and our 4 digit dial plan dialing rule that translates calls TO those extensions from a lync endpoint into +11235556500;ext=4175 format will cause the call to route to the extension when it comes into Lync from Asterisk. 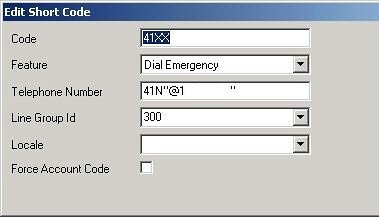 This example extensions 4150-4175 don’t have DIDs but were valid Lync extensions, in order for IPO extensions to call extensions 4150-4175 a short code would be required for 41xx Pointing to the the SIP-Lync ARS Table. (Assuming no other extensions in the 4100 range are homed on the IPO). Then entries for each extension would need to be added to the ARS table. Telephone Number: 41N”@192.168.1.100” (the “”s are required to tell IPO that nothing contained in this part of the string is a variable. All extensions in this range can use this variable. 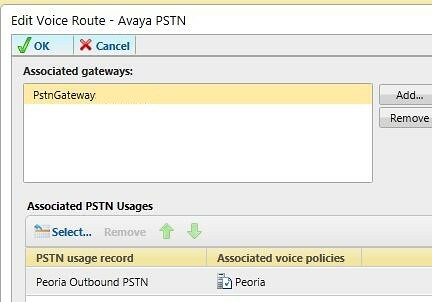 Next you will need to configure Lync to see the Asterisk as a gateway. Edit the properties and go to the Mediation Server. 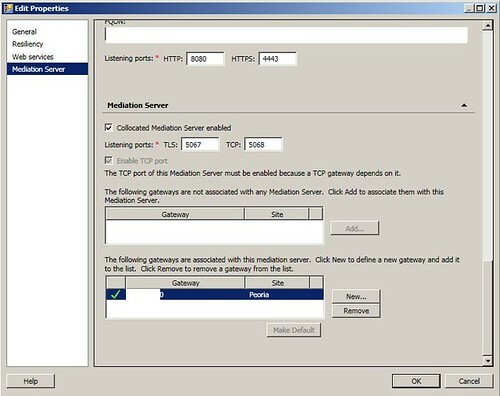 Enable Collocated Mediation Server. 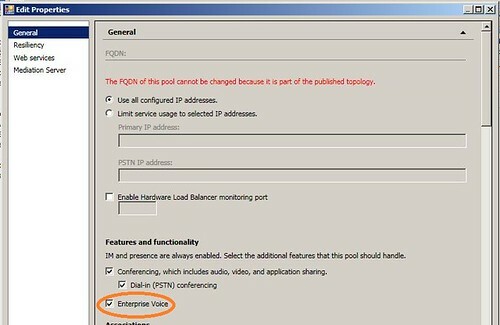 Define your Listening Ports and click new gateway enter the IP address of the Asterisk and the Port that it is listening for SIP traffic on. 2. Configure Dial Plan and Trunk. 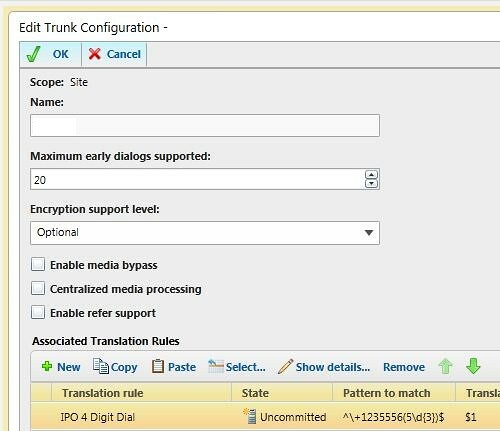 Open Lync Control Panel and go to Voice Routing then Trunk configuration open the newly added Gateway and change the Encryption support level to Optional, Uncheck Media Bypass, Uncheck Centralized Media Processing and Uncheck Enable Refer Support. 3. Add a translation rule to call 4 digit extensions on the IPO via the Asterisk. This allows a normalized call from the Lync server to pass just 4 digits to the IPO so it correctly routes to the extension on the IPO. This rule tells the Lync server to simply pass 65xx to the IPO. This rule tells the Lync server to pass 11 digits to the Asterisk. 4. Create a Call Route. Select New Route and name it and add a description. Leave the Pattern to match the default “*” which matches all calls. 5. 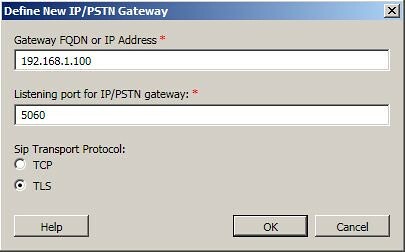 Scrolling down select Add for Associated Gateways and select the PSTN Gateway. Do not yet associate a PSTN Usage. But confirm the Gateway is added. 6. Create a Site Voice Policy Choose new and select the site you want to add a voice policy for. Add a Description and enable all appropriate features. Then New. 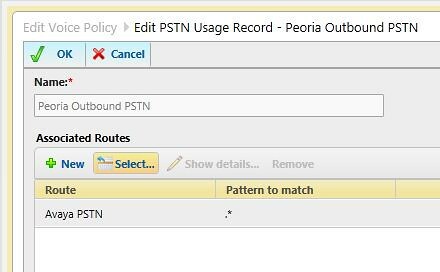 Go back to Routes and edit the Asterisk PSTN route and scroll to the bottom and Associate the PSTN Usage created. Finally you need to configure the Asterisk. Next Define your Dial plan to forward all calls. Line 2 passes 4 digit extensions dialed from the IPO that don’t have a DID. One item to note, the value of 45 is the seconds the phone rings before disconnecting the call. 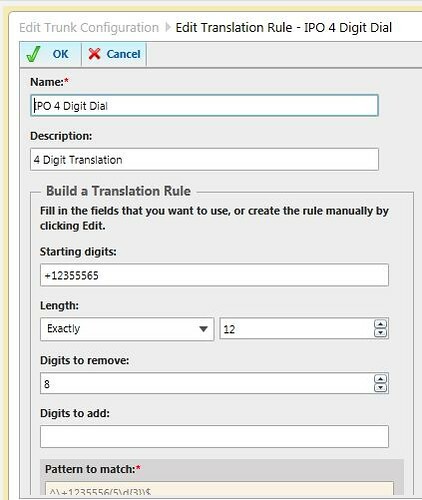 We had to change the default of 30 to 45 because when someone would call a cell phone FROM Lync via the IPO PRI the call sometimes wasn’t getting to the cell phone voicemail before the 30 seconds and would drop the call before the Lync caller could leave a voicemail for the person they were calling. After adjusting this value above 30 these dropped calls stopped happening. You are new ready to make calls from lync to the PSTN and place calls on hold. HellO! Follow this article,and configuring ASterisk as SIP Proxy between Avaya IPO and Microsoft Lync, but transfer and hold problem still exist. May be some specific settings of asterisk needed? Great suggestions and just the setup im working with, although I spent a lot of time debugging to find out what was wrong as there are many typos in your text. (although the screenshots show the correct entries). Not being an expert linux user this threw me off for. Specifically the extra “,” you put in after DIAL and having the wrong trunks dialed in your context. Thanks for noticing the errors in the configs i typed out.. you are correct the screen shots are from a live install so they were more accurate than the text i had typed. I updated the post to reflect your feedback. Thanks. PSTN Gateway needs to use TCP for transport. Correct me if I’m wrong. Sergey, Yes i believe you are right, good catch.. i missed that in the screen shot.